Rahul Gandhi responds to Manohar Parrikar’s letter says did not disclose details of their meeting. The war of words between Goa Chief Minister Manohar Parrikar and Congress President Rahul Gandhi intensified late Wednesday after Gandhi responded to Parrikar’s scathing letter accusing the former of using a courtesy visit for political gains. “I have not shared any details of my conversation with you when we met in Goa yesterday. In my two speeches since we met, I have referred to what is already in the public domain,” Gandhi said in a letter. 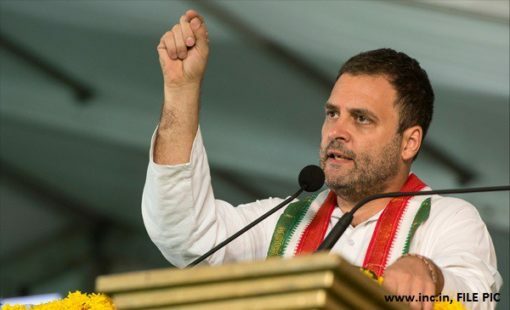 The former defence minister fired the first salvo slamming Rahul Gandhi on Wednesday in a letter stating that the two did not discuss the Rafale deal during a courtesy call Gandhi made to Parrikar’s office on Tuesday. “In the 5 minutes you spent with me, neither did you mention anything about Rafale, nor did we discuss anything about/related to it. Nothing whatsoever about Rafale was even mentioned in your meeting with me,” Parrikar had written in a letter that was widely reported. “Paying a courtesy visit and then stooping so low as to make a false statement for petty political gain has raised, in my mind, questions about the sincerity and purpose of your visit itself,” Parrikar further added. In response Gandhi referred to an incident from April 2015. Below is an extract from his letter. Rahul Gandhi had paid a visit to Parrikar office on Tuesday and tweeted that it was a personal visit to wish him a speedy recovery. Following the visit he addressed booth level party workers in Kochi where he made the following claim. Gandhi claimed Parrikar admitted that the prime minister did not consult the defence minister while changing terms of the deal. But he did not specify when Parrikar supposedly made the admission.